The size is the same as the first Eyezon about 10.5 inches tall. Full details very soon and more pics ! Also to clarify something I emailed in a Max Toy email update, while this coming SDCC 2013 will be my last appearance, I will still be attending future SDCC, but as a Fan. My customs and toys will still be available at this and other events … and I will be at upcoming events including Toy Karma show Oct 5th in Chicago at Rotofugi, plus several other events this year and into Summer 2014. 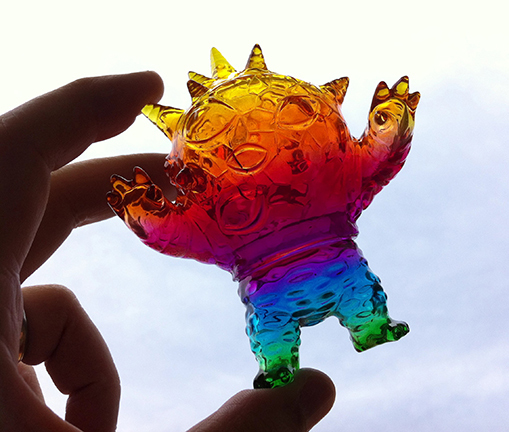 This entry was posted in Uncategorized and tagged art show, comic con, custom toy, eyezon, kaiju, mark nagata, max toy, max toy company, soft vinyl, toy karma. Bookmark the permalink.